One thing you may not know about me is that I share a lot of morally charged articles on my personal FB page. It gets me in trouble with friends sometimes, but it often leads to good discussion too. I don't post those things on the blog page because its not what you all are there for, but in my personal life, I guess I like to passively stir things up a bit. Surprised? But I'm all about being real around here and my beliefs are part of me, so sometimes I feel the need to mix things up a bit over here too. I've been thinking a little about leopards this week because of all of the talk on FB about a certain female hunter. There are plenty of opinions out there and I can see all sides of the issue. I definitely love animals and value animal life. For example, we have two cats and I dream of someday owning a miniature pig. Also, yesterday Soren saw a snake in our yard and brought it to the house for the kids to see. Unfortunately he had hit it with a stick first because he couldn't tell what it was doing or where it began and ended when he found it. The hit mortally wounded the snake and I couldn't bear to watch it writhe on the deck. I had Soren put it out of its misery. A snake pulled my heart strings y'all! A snake! So yes - I really despise cruelty or pain towards animals. That being said - we eat meat. We drink milk. We own a leather business, although all of our leather is a food industry byproduct (meaning the animals would have been killed anyway). I do believe animals were created for man to use - wisely and respectfully. Anyway back to leopards. This article is really what hit home with me. Would I hunt African animals? Nope. I wouldn't hunt anything. I'm sad to see any animals die, even if it helps the local economy and environment. But the issue at hand is not about someone hunting big game in Africa - what I'm interested in is why our country can get so outraged about this. While this type of hunting seems unusual to us, first world folks who grew up in awe of the exotic African animals, I doubt it is. This gal is certainly not the only one doing this and just like all other social media posts, I'm sure we don't and can't understand the entire situation based on a few FB photos. When do FB photos EVER tell the whole story of ANYTHING? What the article points out that I really agreed with is the moral inconsistency that surrounds this outrage. Matt says it all so much better than I can, but I can say that as a mom and a Christian I will never be anything but pro-life: pro everyone's life. Life is a gift. I wish that people who fight so hard for these animal's lives would put the same effort and zeal into fighting for everyone's life. I hope to do more myself. I'd love to hear your thoughts - provided they are kindly spoken - as they always are. Have a great Sunday! Saw that article on facebook too and totally agreed. That's a very good article! Thanks for sharing. 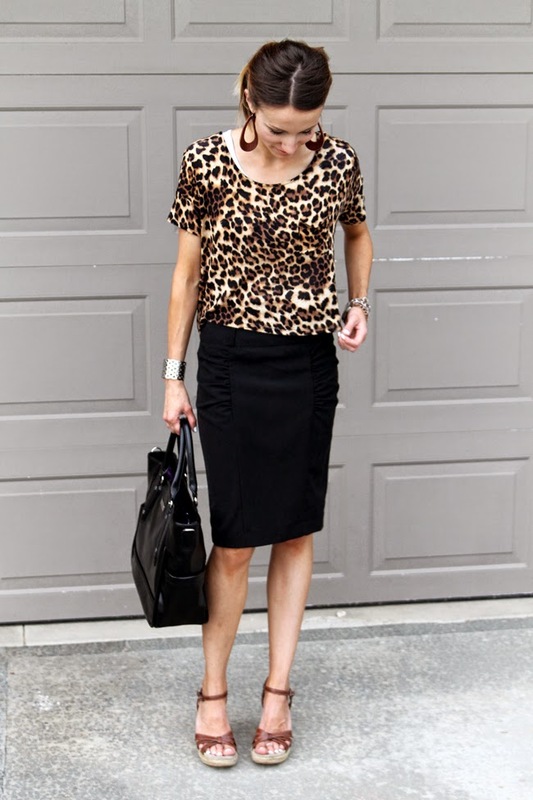 Love your leopard and black pencil skirt combo. Just received my first two pair of Nickel & Suede earrings, and they are as amazing as you say. Thinking of getting the camo print next; I got the gold and rose gold -- fabulous! As for the animal / pro life issue, it's the fact that so many people have guns and want to use them that is abhorrent to me. The school shootings, that young man in California who killed people because he was unhappy in his own life -- those are the things that I find so disturbing. I pray we can all find a better way. I love that you speak up for what you believe in! Love this look - it's so classic - and I'm ALWAYS having a leopard moment. I haven't read the article yet... however, I did so the pictures of the girl and her "kill". Honestly I was appalled and living in Italy I just don't see this bragging about killing things there. Interesting article! I really agree with the whole idea of moral schizophrenia - why some lives seem more precious or valuable than others. It’s what brought me to being vegetarian, and then vegan, in the first place. I couldn’t reconcile the love and connection I felt with my pets versus the acceptance of how animal parts ended up on my plate. Like, why is a dog or cat’s life more important than a pig or cow’s life? Why do we buy comfortable beds for our beloved pets but feel okay knowing other animals were tortured and killed for our dinner? I’m certainly not pro-hunting, but I do believe that animals who live in the wild with their families and are killed in a quick, respectful way have it a whole lot better than the ones raised for food. When I was first flirting with vegetarianism, I did some research into factory farming, and it’s the most horrifying, grotesque thing. So much worse than I could have imagined. And since I really am pro-everyone’s life (for me, that includes animals and every other living thing), I couldn’t be part of such vile cruelty. Whatever form it takes, life is intentionally created and precious, and I believe it should be treated as such. So I’m not telling you what to think about these things, I’m only telling you that you need to think about them. And, once you do, maybe your priorities will change a little bit. This whole thing has sparked outrage everywhere. I'm also a christian and respect life. But I just wish people would invest much more time on conserving human life. I get it, they are animals and most of the time they are helpless... but at the end of the day, you can't judge a girl when you enjoy animal by products. Leave her alone. anyways, I love animal print and this looks lovely on you.